As the more than 1 million Americans who speak Korean can attest, Korean is here to stay, and generations of young (and older) adults are determined to learn it. This book is for people who want a grasp of how to speak, write and understand Korean—and who want to enjoy things while they're at it! Using a lighthearted, humorous approach, Korean for Beginners starts by showing you just how reasoned and logical the Korean alphabet, hangeul, actually is, and helps you master it faster than you learned the English alphabet. Realistic situations you might encounter in Korea in Korean-speaking environments are described, and new words are explained in terms of how you'll find them useful to communicate. Numerous illustrations enliven the text, and a CD-ROM bound into the jacket lets you listen and repeat phrases in the book. Soon you'll be able to say with pride, "I know Korean!" 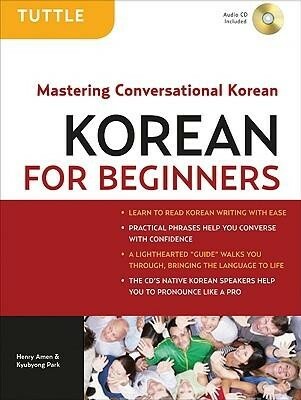 Weiterführende Links zu "Korean for Beginners"
Unser Kommentar zu "Korean for Beginners"
Kundenbewertungen für "Korean for Beginners"